I attended a photo workshop up in the Michigan UP a few weeks back and took a cruise along the park area. 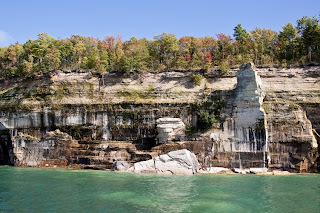 To see the Pictured Rocks you need to view the shore from a boat for the best view. The workshop was with Lake Affect Photographic Adventures (Hank Erdmann & William Clay). The Fall color was late and the weather got overcast for most of the weekend. They now have snow up in the area according to the weather channel reports. I enjoyed the workshop and the Hiawatha National Forest & Pictured Rocks area is a great location for Fall color when the weather is nice. I'll post some pictures from the forest as they get processed.